A recent study claimed that more than 85% of all businesses have a dedicated social handle which they used as part of their products’ promotional campaign. With the introduction of more social media platforms, each day to keep people in sync with what is new in the world, the business of online promotion through social media is a booming field. Search Engine Optimization is a term that can be confusing, even if you are a wee bit ignorant about what it is and how it is done. Companies that hire such companies will be doing themselves a huge favor, if they understand how important it is for them to cross question SEO companies and consultants about what they are, how they do, what they do and how best they do it! Bloggers are confronted with the challenge of creating unique and innovative content to raise their ranking. There are millions of blogs that come up with endless topics, and it seems that all topics have been covered. Quality is a major factor that cannot be compromised if you are looking for blogging success. A thousand websites are popping on the internet every single day in every field imaginable. If you are planning on launching a website to promote your products or services, you have to keep a couple of things in mind to make sure that your website is noticed by your targeted market segment. Want To Discover A New Way Of Growing Your Business? Why Pinterest Matters In A Business! 10 Content Marketing Ideas To Sell Anything In Any Industry! Why your websites should be mobile friendly? Why video marketing is the latest trend that you must make note of? Anything that can be seen drives the message harder than any other medium. With social media ruling everything in our lives, it is estimated 10 billion videos are being watched every day. The Effective way to use SEO for Lead generation. 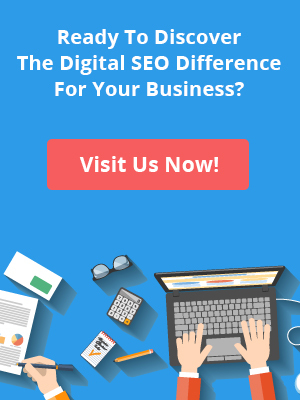 Digital SEO is an assortment of talented professionals with diversified portfolios to form a team comprising of management personnel, web designers, multimedia specialists and digital strategists who work in an integrated manner to generate the desired outcome from projects.